"It's the bum who lives in the Bowery, who doesn't have his teeth, who hasn't had a shower in five weeks, who has lost his job and his wife and his children and probably has been to jail a couple of times," she said, taking a sip from a can of Diet Peach Snapple. "That's a low-bottom, severe alcoholic case. But there are high-bottom cases and I am a high-bottom." Hazard, 46, is a mother, a wife, a career woman and a recovering alcoholic. "It was like brushing my teeth: every night I would come home and pour a glass of wine," she said. "I would have a glass of wine while reading my son a bedtime story. I would do my Christmas cards with a glass of wine. On the train commuting home from New York I would have a glass of wine. I never, ever, ever thought that alcohol wouldn't be a part of my life." Hazard has not had a drink in 10 years and four months. Alcoholism runs in Hazard's gene pool. She grew up among people who consumed hard drinks openly and frequently, and for some of them, that culture became addictive and destructive. The National Council on Alcohol and Drug Dependence (NCAAD) defines alcoholism as a chronic disease triggered by genetic and environmental factors. Hazard diagnoses her own drinking as a result of both. Hazard remembers the first time she drank to intoxication. She was 16 years old, at a party and on a diet. As she poured drink after drink into an empty stomach, she became ill. Hazard said she never drank herself sick as an adult with alcoholism. Even as a college student at Tulane University, she said her drinking was never out of control. "When I got to college, I was like Florence Nightingale," she said. "I dated a guy who was a serious drinker to the point of blacking out, and I had other friends who were serious drinkers. I was usually the designated driver. But it's not like I wasn't drinking, I was just always the least drunk of the bunch. What's interesting is, I think that because I wasn't drinking as much and I was being more responsible, I wasn't seeing where my own drinking was going." Hazard remembers instances when her boyfriend was so inebriated that he lost track of where he was and what he was doing. "I was so freaked out by that," she said. "My drinking in comparison to that kept me thinking that I was good and I was OK because I was nowhere near that kind of behavior. I always thought, `That's not me. That's an alcoholic. I'm never going to be an alcoholic. That's in my family, I know what it is, I see that pain it brings and that's not me.' I always had this belief in my mind that I was never going to turn into an alcoholic; by hook or by crook, it was something I was never going to do." As a young, single woman launching her post-college career in Manhattan, Hazard said she started using alcohol to aid a purpose other than socialization. She and her roommate went on what they dubbed "the new attitude diet": a nightly dose of steamed spinach and a bottle of champagne. About 50 percent of people with eating disorders abuse alcohol or illicit drugs, according to a report by the National Center on Addiction and Substance Abuse (CASA) at Columbia University. Hazard said she and her girlfriend lost 10 pounds in about 12 days. "I often used drinking as an appetite suppressant," she said. "So that, for me, created a little special bond. I was happy to drink because it was another way for me to lose weight or control my weight. When I would start drinking, I wouldn't be that hungry, and you certainly don't want to take away the buzz by eating food, either." Hazard married young to a successful producer. The pair briefly relocated to California, where she became pregnant. "The minute I knew I was pregnant, I stopped smoking and I stopped drinking," Hazard said. "It wasn't even a question. For me, there was no `should I, should I not' around that. It was crystal clear. It was like a mothering instinct took over and I knew that I would not do anything that would harm or damage my child." 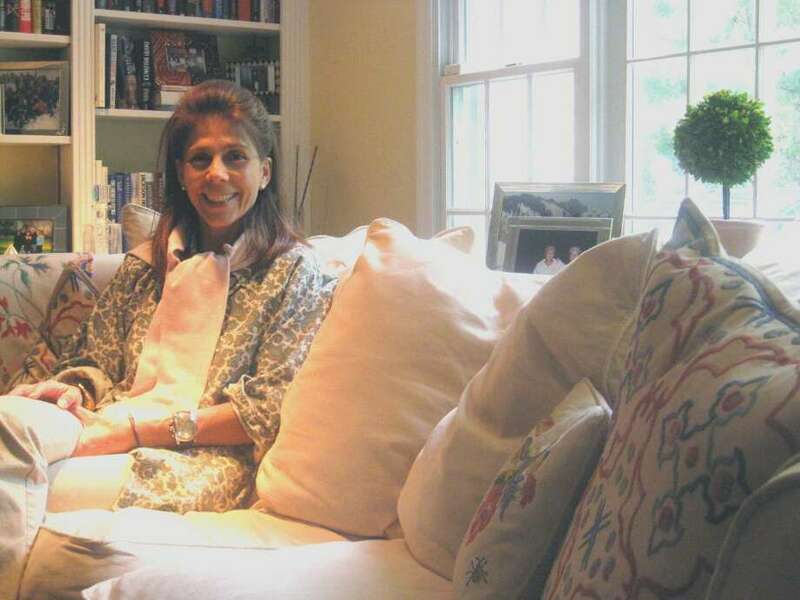 Hazard, her husband and their newborn son moved back East to a large home in Darien. As one of the first couples in their social circles to marry and buy a house outfitted with four guest bedrooms, the pair began entertaining almost nightly. Hazard said the evenings played out like parties with guests, laughs and drinks flowing. When Hazard and her husband divorced, she left the parties behind. But she held on to her ritual cups of Kendall Jackson wine. "At this point it's me, my 5-year-old son, a nanny and two dogs, and every night I'm literally pouring myself a glass of wine, a second or a third and I'm basically keeping myself company," she said, adding, "I began to do things and drink in ways that I swore only people with drinking problems or alcoholics would do." Hazard began to blow past the boundaries she spaced between her own drinking habits and destructive drinking habits she saw in others. For the first time in her life, she was drinking before 5 p.m., drinking to ease a hangover and popping pain medication to dull a drumming morning headache. "I remember having a glass of wine on a Sunday afternoon and thinking, `What am I doing?'" she said. "Because you never drink on a Sunday because you had to get up and go to work on Monday morning. You just didn't. But I was." She added, "I began to do things that I thought were reserved only for people who have drinking problems, and as I did these things I began to get frightened. "I would fall asleep putting my son to bed in my clothes at 7 at night. I would fall asleep next to him after reading a bedtime story and tucking him in and I would wake up at midnight or 1 in the morning in my clothes and I would make it into my bedroom and I would crawl into bed without brushing my teeth and without taking my clothes off. I'm a single mom and this is how I'm doing my life. That began to freak me out." Hazard said she hit rock bottom when she realized that alcoholism -- a disease she said she would never let in -- became damaging to her son, the very person she wanted to protect. "I was so sad and so depressed and so worried that I was losing a grip," she said. "I mean, if you can't even put your kid on the school bus in the morning without crawling back into bed because you're hungover, something's not OK. I was ready." When the light bulb switched on, Hazard sought treatment from a Greenwich counselor who agreed to work with her under the condition that she cease drinking. Hazard agreed, put down the drink and hasn't looked back. But before she decided her alcohol fast would last forever, she struggled to explain the absent glass in her hand at social gatherings. Sometimes she made up stories. She told inquiring faces she was on antibiotics or that she was the designated driver. Her easiest escape from peer pressure and prying questions was a cup of ginger ale. "As long as you had a drink that looked like a `real' drink in your hand, people didn't ask questions," she said. Hazard said a desire to be a healthy role model for her son, especially in a town where underage drinking is problematic, helped her through these first, most difficult steps toward recovery. Today Hazard is a Liberation Programs of Fairfield County board member. She said she maintains an open dialogue with her son about drinking, educates him on alcoholism and keeps a household where he is not exposed to habitual drinking. "It begins with the parent and it begins at home," she said. "The parents in this community, those who are concerned about their children drinking, need to have a conversation with themselves and they need to evaluate their own drinking behavior. This is where it starts, and this is where it ends."